A lot of commercial products have several chemicals in them that many people probably do not know about. Shampoo and conditioner are great examples. These chemicals can lead to many health issues, and some of them are even cancerous. Unfortunately, underarm deodorant is included in that list. Commercial deodorants have many chemicals compounds in them that can actually be very harmful to your body. Thankfully, there are organic and other natural alternatives. There are even DIY recipes for you to make your own shampoo, deodorant, and other hygiene products. However, today we are looking at the best natural deodorant for men. 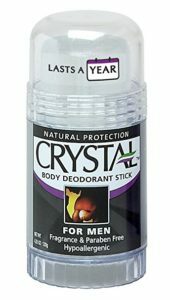 You can find these deodorants online on such websites like Amazon.com. While many people are still new to the whole natural kick, I am here to give you all of the information you may need. After using potentially dangerous chemicals on your body... Here are the best natural deodorants for men. In the chart below, you will find our top 10 rated Best Natural Deodorant for Men. For a more in-depth review of each model, please click on "Read Review." After using potentially dangerous chemicals on your body....Here are the best natural deodorants for men. Nearly every commercial deodorant has certain chemicals and compounds that allow it to perform the way the label claims. Unfortunately, studies link a lot of these chemicals and compounds to health issues, and some of them can be very serious issues—like cancer. Natural deodorants use only natural ingredients to keep your underarms fresh. This means no chemicals, no synthetic compounds, no heavy metals, and etc. 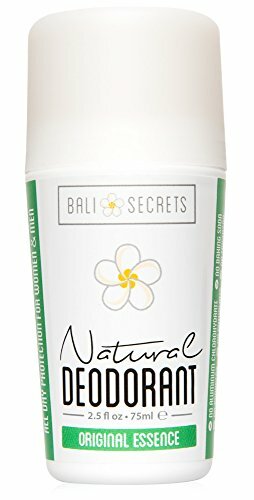 These natural deodorants include ingredients such as witch hazel, essential oils, mineral salts, baking soda, and even hops in some instances. One of the main ingredients used in commercial antiperspirants is a form of aluminum. Aluminum, in the form of aluminum chloride, aluminum zirconium, aluminum chlorohydrate, and aluminum hydroxybromide, prevents us from sweating. How does this happen? The aluminum ions are drawn to cells that line the sweat ducts, causing the cells to swell and squeezing them closed so sweat cannot get out. This is bad because aluminum is also a known neurotoxin that has been linked to breast cancer and other neurological disorders like Alzheimer's. In addition, you can often find other compounds in regular deodorants. Parabens prolong the shelf life. They can irritate the skin and affect your hormonal balance, causing hair loss. Parfum, or synthetic fragrance, can cause skin irritation, as well as propylene glycol and other toxins. The best natural deodorant for men will be able to keep you dry and smelling great without the risk of any health issues in the future. When looking for the best natural deodorant for men, there is actually a lot you can choose from. Of course, most men will just go for the good ol' stick deodorant because that is what most are used to. In actuality, there are a bunch more out there that are pretty cool. There are six popular types of natural deodorant. Each has their own special properties that may appeal to you over another type. The most popular types that you'll find are cream deodorant, spray, crystal, powder, tallow, and the ever popular stick. Some of these are much more unique than others. Of course, the majority of us are used to either the spray or stick, but the crystal is one, in particular, that might grab your attention. This is because it uses mineral salts to minimize body odor. Cream deodorant is also pretty cool because it both deodorizes and works as an antiperspirant. While many will probably choose to stay in their comfort zone when it comes to men’s deodorant, it is always great to try something new. You may find that one of these works better for you than another, so why not experiment a little bit? After all, the search for the best natural deodorant for men may take a little time to test out. While most people are probably new to the whole natural kick, there are things that will sound weird and maybe even confusing. Actually, there are some things that will happen once you finally make the switch that may alarm you. So here are some things to consider when buying the best natural deodorant for men. One of the most important things when choosing the best natural deodorant for men is what makes it up: the ingredients that are used in the container. There are three ingredients that you should look for. The first is absorptive power, like baking soda, cornstarch, or tapioca powder. This will help to minimize moisture and adjust the pH in the area. (Be sure that you are not overly sensitive to baking soda first) Next is antibacterial agents, like essential oils of lavender, tea tree, lemongrass, or thyme. These can suppress the bacteria that cause that smelly body odor. Finally, look for a conditioning agent. These could be ingredients like shea butter, which will help keep everything smooth. Men need that too. No one likes a harsh deodorant. Most men do not want to walk around smelling like flowers all day. For those who do, I'm not judging. Natural deodorants come in a number of different fragrances. Plus, all of them are natural. Actually, a bulk of natural deodorants are completely fragrance-free, so there is nothing to worry about. But if you are looking for a specific smell to pair with your body spray or cologne, it will not be hard to find. Just be sure to take a look if the deodorant has fragrance or not. The whole point of deodorant is to… de-odorize your body. If it does not do that, what is the point? Be sure to check the strength of the deodorant to see if it is right for you. There are some deodorants that are made for a specific body type, like active or otherwise. This means that if you go to the gym a lot, you will need a deodorant that is able to keep up with your body. Certain ingredients in natural deodorants can be harsh, depending on the type of skin you have. If you have typically dry skin, you will need a deodorant with a good conditioner like shea butter. Some brands will actually state on their labels or packaging that they are meant for sensitive skin. Labels like that are a good thing to be on the lookout for. Further, some people are very sensitive to baking soda. To avoid any annoying or possibly painful instances, be sure to test small amounts to be sure that you react fine to the ingredients. This is a great thing to look for. Many people, maybe yourself included, have allergies to various things. My dad is allergic to grass... go figure. Anyway, the last thing you probably want to happen when using deodorant is to have an allergic reaction. The good thing is that many brands make their natural deodorants completely hypoallergenic. This way, you can rest easy knowing that your armpits are safe and secure. As mentioned before, there are six popular types of natural deodorant. Each of them has something special that makes them unique. All are relatively good, however, there are some things that put some above the other types. Ultimately, it is up to you and what you like. But this may be able to help you decide which is the best natural deodorant for men. If you are looking for something a bit different but handles everything a deodorant should, this may be the one for you. Many cream deodorants use a natural plant, fruit, or nut oil and butter to create a good moisturizing base that makes applying it nice and easy. When it comes to moisture control, they often have great absorbent compounds. These can include natural clays, arrowroot powder, cornstarch, or baking soda. Just remember to test the baking soda first to be sure you aren't sensitive to it. Cream deodorant can come in either fragrance-free or a natural fragrance. If you want a scent, expect to find a blend of essential oils that gives it a great scent. It is a cream, opposed to a dry or wet rub. Some people do not want to rub cream into their armpits. The quick way to deodorize is spray deodorant. It only takes a few seconds to spray it on and neutralize any bad body odor you may have. Spray deodorant may include essential oils, botanical ingredients, aloe vera extract, alcohol, activated charcoal, or natural juices or extracts. The spray is perfect for those who do not sweat a lot but still struggle with body odor. However, if you do sweat a lot, a spray may not give you enough coverage because they typically do not include any absorbent compounds. Spray deodorant also can contain alcohol which can dry out your skin. Especially if you suffer from dry skin, this may not be the one for you. This is probably one of the most unique options available. 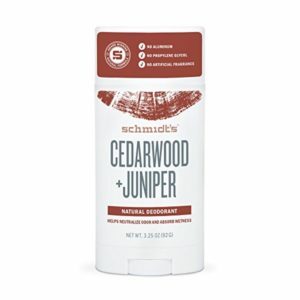 This deodorant is made from mineral salt and is among the best at getting rid of body odor. While it is not the best at absorbing moisture, it keeps odor at bay for nearly 24 hours. In addition, the crystal lasts for almost a year or more with the intended use. However, the mineral salt can be irritating for sensitive skin, so be aware of your skin type. In addition, some brands have started adding aluminum alum to their crystals in an attempt to get into the antiperspirant game. Since aluminum is probably one of the reasons you are making the switch to natural deodorants, make sure your crystal is 100 percent natural. 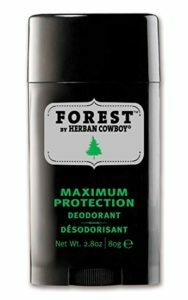 Plenty of deodorants are great at minimizing body odor, but this one is perfect for getting rid of that annoying sweat. It is often made up of natural clay, arrowroot powder, cornstarch, or baking soda. You can also buy it with added essential oils for fragrance. However, the powder will probably clump up while it absorbs the sweat throughout the day, and it may stain some clothing. In addition, it is probably not good for extended periods of activity. Here we have the most traditional natural deodorant. 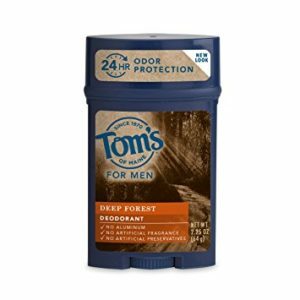 Most people are more than used to the stick deodorant, so this is obviously the most popular choice for people just getting into the natural deodorant game. Plus, it is pretty much the best overall choice, as it both deodorizes and absorbs sweat well. 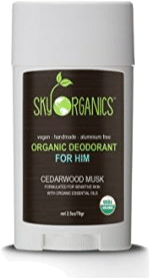 Most natural stick deodorants are usually made up of a form of natural oil or butter, like shea butter, along with baking soda or one of the other natural absorbents, with essential oils added for the fragrance. In fact, there are several essential oils that are antibacterial by nature, like tea tree oil or neem oil. However, they have a fairly strong scent, and some may not like that. Of course, you can buy them fragrance-free, but then you would lose the antibacterial properties. There is also the occurring issue with the baking soda. Basically, just read the label and pay attention to the ingredients before you make the buy. For those of you who are vegetarian, vegan, or animal-friendly, this is definitely not the best natural deodorant for you. Tallow deodorant is made from animal fat. While that may sound weird to be rubbing on your armpits, the stuff is full of vitamins, minerals, and fatty acids that your skin loves. While it does not have any absorbent ingredient, it is antimicrobial which makes it a great way to keep your underarms moisturized. Unlike the cream, it has the consistency of a balm, which makes it much more comfortable when applying. People have often praised tallow deodorant for its fragrances. However, it does tend to be expensive. When looking through the various types of natural deodorants, there are a few things that become common occurrences. 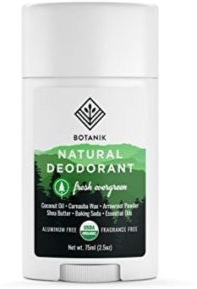 The following are features that you should be on the lookout for when trying to find the best natural deodorant for men. However, you are the final judge. You know what you like and do not like. USDA Organic ingredients. There should be nothing synthetic, especially aluminum. I have gone through all of the reasons why natural deodorant is better than the regular stuff, as well as explained what makes up natural deodorants. Hopefully, you will turn to this when trying to find the best natural deodorant for men. 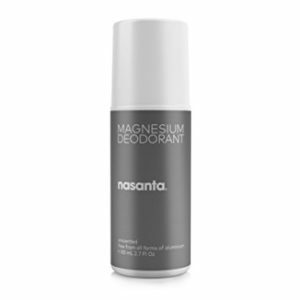 Be sure to check out our individual reviews of the top 10 best natural deodorants for men.